This tutorial explains how to apply self join in SQL query. Suppose you have data for employees. It comprises of employees' name, ID and manager ID. 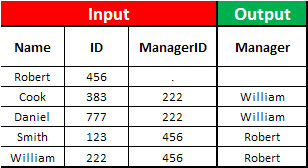 You need to find out manager name against each employee ID. Suppose you have data for employees. It comprises of employees' name, ID and manager ID. You need to find out manager of manager's name against each employee ID. 2 Responses to "Proc SQL Self Join Tutorial"
Understood it clearly... Thanks a lot for posting..